Posted By PA Breast Cancer Coalition on May 11th, 2018 at 1:32 pm | 0 comments. 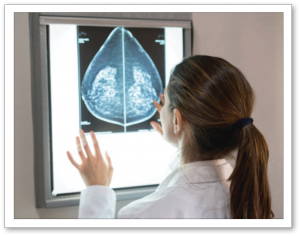 If you are considered at higher-than-average risk for breast cancer or you have dense breast tissue, the American College of Radiology (ACR) now recommends you get an annual screening MRI in addition to a mammogram. The new recommendations, published on DenseBreast-Info.org and in the Journal of the American College of Radiology, call for MRI if a woman is considered high risk. The ACR continues its previous recommendations, supporting MRI beginning at age 25 for women with a BRCA1 mutation. Posted By PA Breast Cancer Coalition on May 10th, 2018 at 12:51 pm | 0 comments. 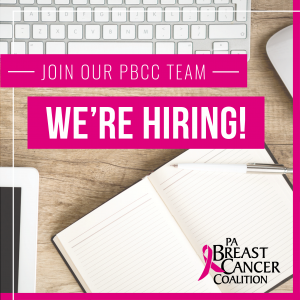 The Data & Administrative Coordinator will work with all PBCC staff members to help keep the office running smoothly. We are looking for an ambassador, a team player, someone who can work with different personality types and is outgoing. We need someone who’s friendly, organized, detail-oriented and is willing to help with projects as needed. 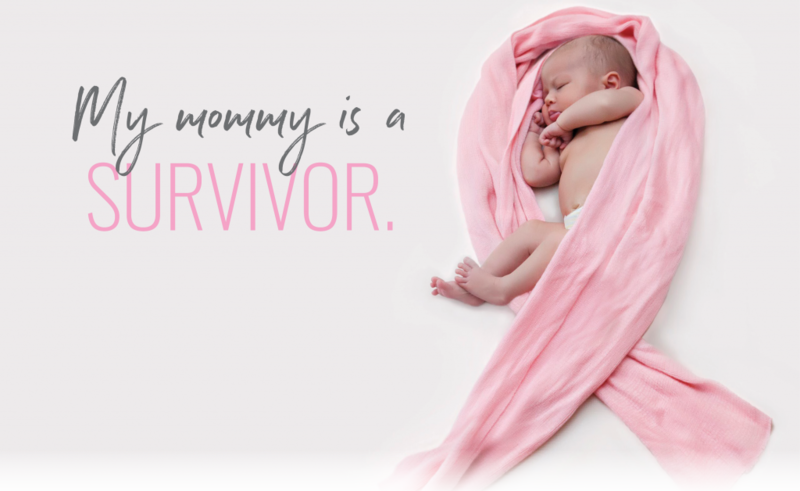 Posted By PA Breast Cancer Coalition on May 4th, 2018 at 3:10 pm | 0 comments. 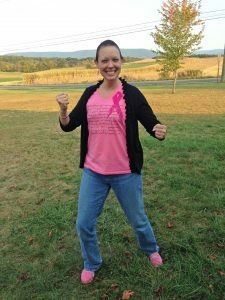 Tori was a 34-year-old single mom when she was diagnosed with Stage II breast cancer. While in treatment, she met her now-husband, got married and had their “miracle” baby. Tori is a fighter, thriver, and survivor. This is her amazing story. In January 2013, I felt a lump while adjusting my bra but cancer didn’t even occur to me at the time. That March, my Dad, who was a one-year prostate cancer survivor, sent me an email about breast cancer being on the rise. Within a week, I was diagnosed with invasive ductal carcinoma. I had six rounds of chemo, 11 rounds of Herceptin and had a bi-lateral mastectomy in August 2013, and then I met my now-husband. 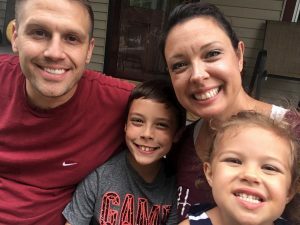 We didn’t think I could have children, but I got pregnant after the mastectomy, so I had to put the Herceptin treatment on hold. A few doctors suggested I shouldn’t go through with the pregnancy, that it was high risk. My daughter Finley was born in October 2014 and then I started Herceptin again. Did you have a lot of support? Yes! My parents and my co-workers were very supportive. You came to the PBCC with a specific concern. What was it? I started a Facebook group called Pink Sisters in Christ. And just from communicating with people on there, I discovered that I wasn’t the only one whose eyebrows never grew back after chemotherapy. Some mentioned losing eyelashes too. I draw them in every day but microblading is a very effective way to put them back on. The cost varies by area and can run anywhere between $300 and $400. My goal would be for there to be an option for women or men who choose to have this done to have at least a portion of the cost covered by insurance. Cancer doesn’t discriminate. I never thought at 34 years old I’d feel a tumor. I do think there are some things we can do. My doctor advised me to leave my counseling career behind because it was too stressful. I now work for a company that manufactures nontoxic products, and I educate women about inflammation in the body caused by stress, processed foods, and even where you live in the country. Do you have advice for someone whose friend or family member is diagnosed? Be respectful of the range of emotions they are going to go through. A lot of women tell me they are happy one minute and enraged the next. Be part of a supportive environment to accept those range of emotions. And remember that every journey is different. What’s important to one is not to another.